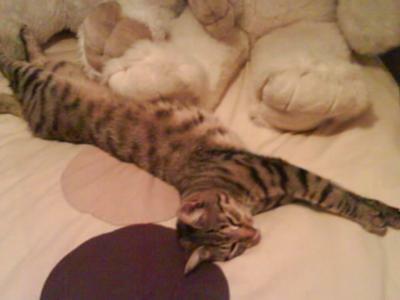 Cleo stretched out across my bed. My cat Cleo is a little tinker. She climbs on the worktops, brings half alive birds in the house and begs for chicken and ham. Even though she is a tinker she is loved by many. If you hold a piece of meat above her head she and say sit and stay she will stay, then if you say come and get it she leaps up for it and swallows it in one! She gets along with my other cats and washes the little one. Your cat sounds awsome, everyone should have a cat like you!